Oh my goodness, it feels like forever since we've visited. So grab a drink and maybe even a treat, have a seat and let's catch up! For those of you that don't know, we are now finally using the POS System. For the most part it is working pretty well now. Big relief! Shop Hop is over and it was so fun seeing so many of you. If you didn't make it in..... the store broke ground (TA DA) on the first day of Shop Hop. Yep, the watched pot thing worked. Footings are supposed to be poured tomorrow. It's getting more real every day. We were a Quilt Retreat so we got to wear PJ's, who doesn't sew in their PJ's? We played Spin the Bottle for prizes. We had chocolate covered popcorn, it was just fun! 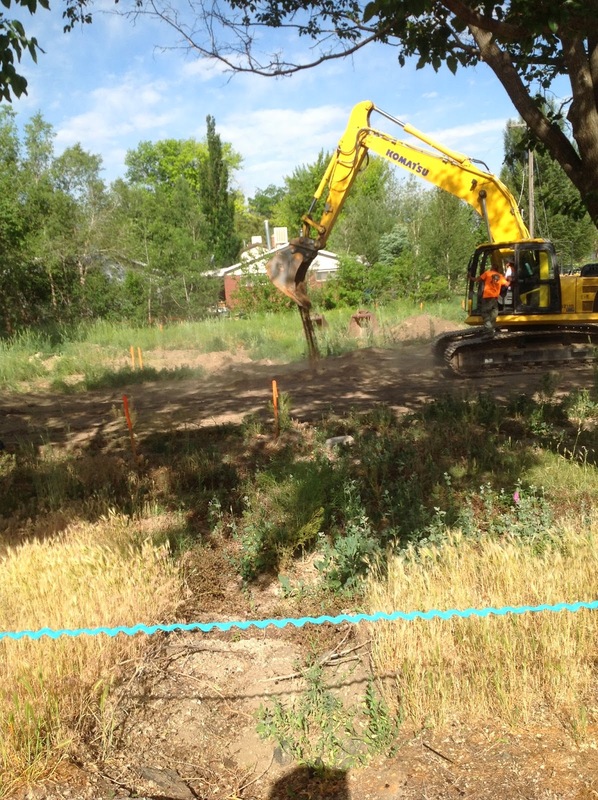 At last ground was broken! Our quilt was hung on the porch! 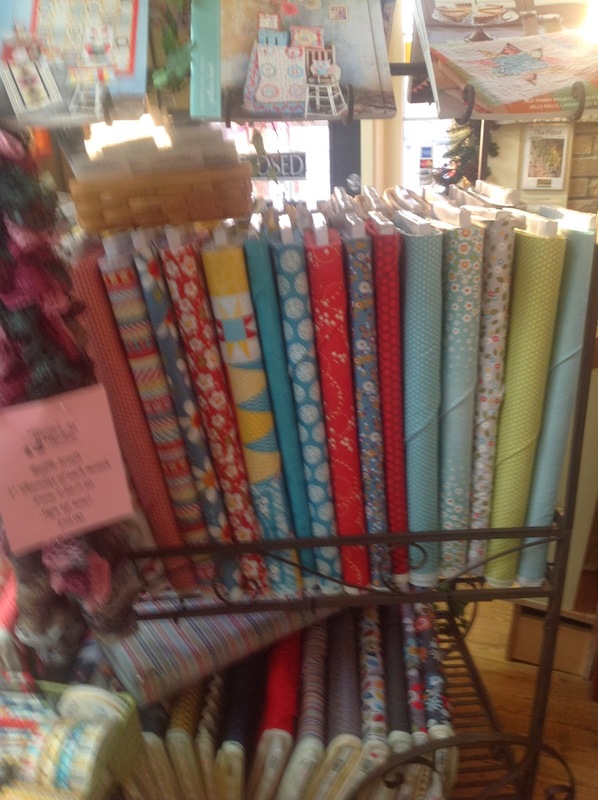 So many new fabric lines have come in, it's crazy. 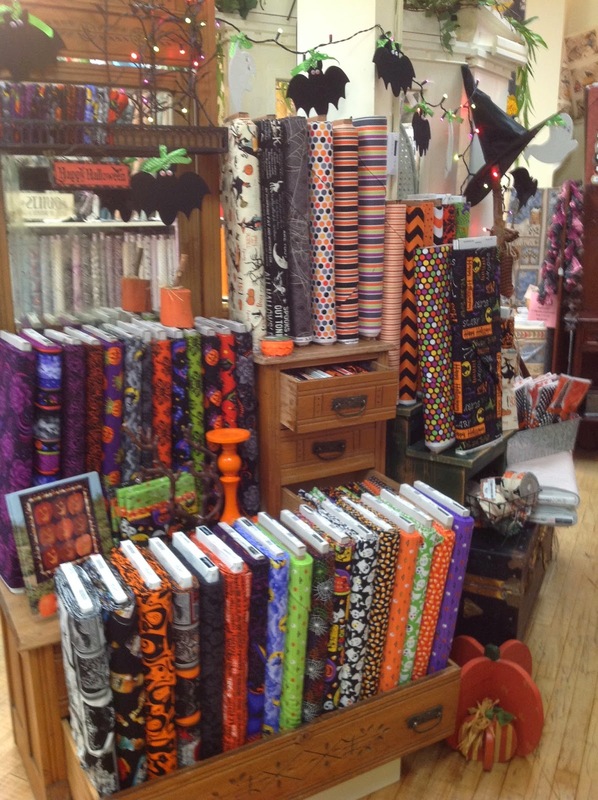 We even have the new Halloween lines out. Next month we will have Christmas in July. Can you believe it's time to get started on those projects. Boy time does fly doesn't it? We will also have our class sign ups for Summer and some for Fall. 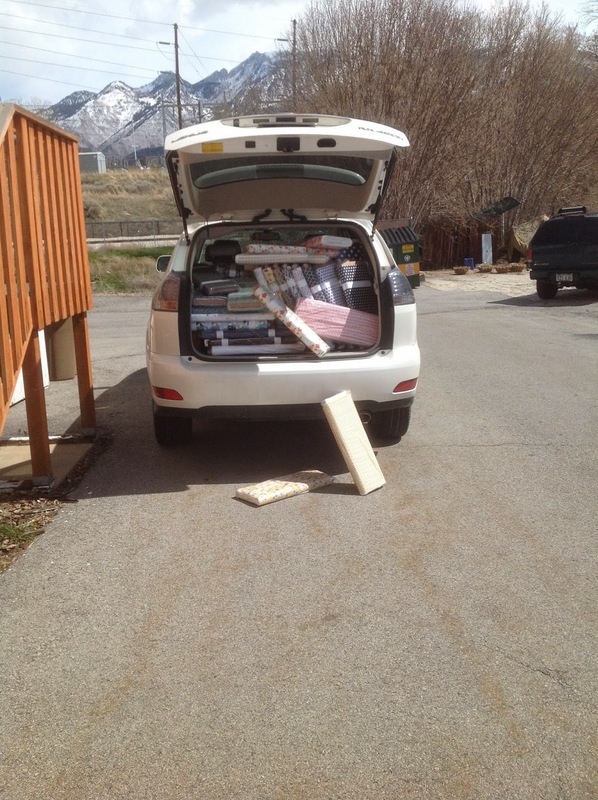 Even Leesa is hauling it in! It's been so warm and getting some rain the other day was a real treat. Well it was a treat to me and probably to the plants in my yard. (I am so not good at going out and watering.) 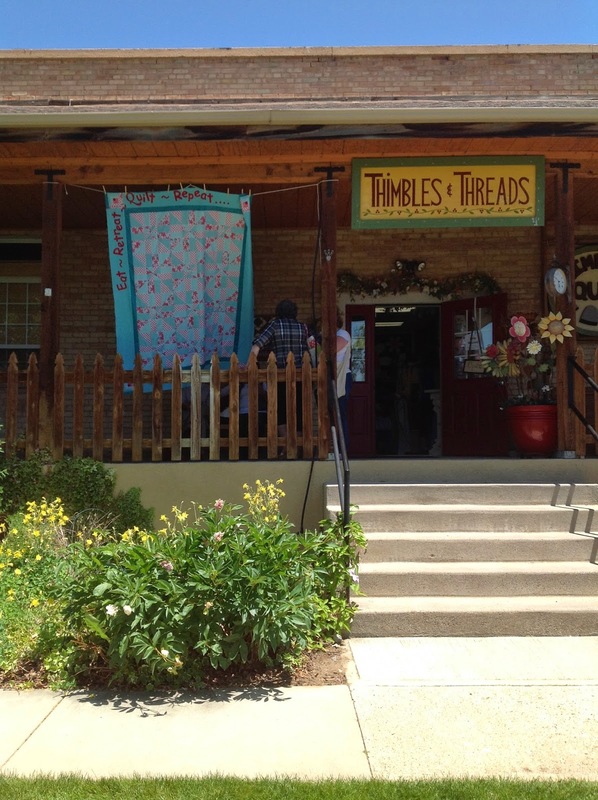 I stood outside on the porch here at Thimbles and Threads and just breathed in the fresh air cleaned by the rain. It was awesome. It reminded me of being at my grandmas house in the Summer and sitting out in this old wooden rocking chair in the back yard under a plumb tree. The tree protected you from getting wet, and you could just sit there and daydream and enjoy the summer rain. I loved it! But as the afternoon wore on, grandma would call me inside because her programs ( she always called them "Her programs") would be starting and she needed me to come in and watch because she was afraid she would fall asleep and miss something. So she needed me to let her know what happened. I had never watched a soap opera before. I sure got attached to it with my grandma. She loved the Edge of Night and the Secret Storm. For those of you that remember this product....Grandma would have me run to the store (I really did run.) to get her Clover Club Corn Crinkles. That was her snack for her "programs". I miss those Corn Crinkles, they were yummy, oh by the way. I don't know why but if you kept them in the freezer they were yummier. Weird huh? Thanks for taking the time to play catch up with me. My mom would have called it "Playing Possom"
Spring is soooo in the air, you can almost taste it. It has been pretty warm in the store and we have been opening the door to help cool it down. Gosh, even this last weekend at home I had the windows open. It was really nice. Even the icky tree in my backyard is leafing out as well as the bush in the corner that my son keeps trying to kill. (Whacks the darn thing down to almost nothing, thinking oh darn.....I've over done it this time and killed it! But no, it just grows back in no time.) Well it is leafing out as well. Fair to say....Spring has sprung! Ohhhh and while I was outside taking the picture (below) of the ever deepening hole. It smelled so fragrant outside. All the Spring blossoms, yummy. I noticed the neighbor had laundry hanging out on the line. A sure sign of Spring! I would have taken a picture but I thought they might think it was weird that someone was taking a picture of their laundry ,or worse , who the weirdo was that was taking a picture of their laundry. Ok, work with me here. I've kept my promise...... I have barely kept a teeny weeny bear peek of an eye on the building site across the street. Well.....did you read the email that just went out? Yes, real digging should be happening very soon! I think my strategy is working.......Just sayin. I know there hasn't been any back hoes over there. But see for yourself. It seems a little deeper to me. I sorta thought the guy that did the work in the fall left it a bit flatter than this. 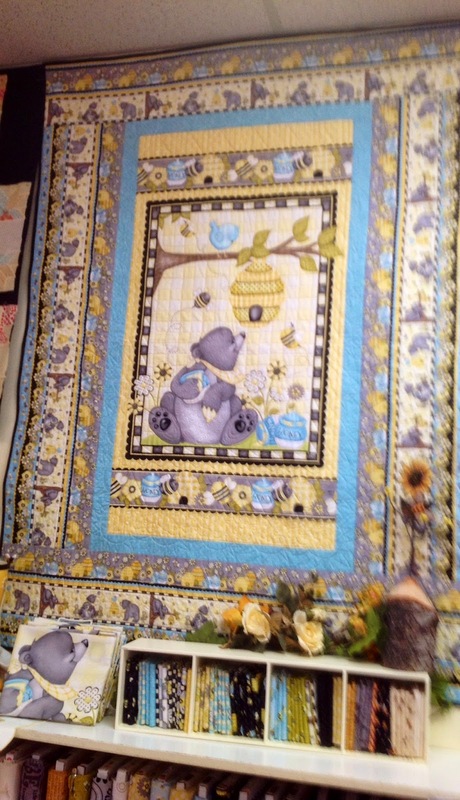 See how cute this quilt is? Guess what....it's not even for a child. 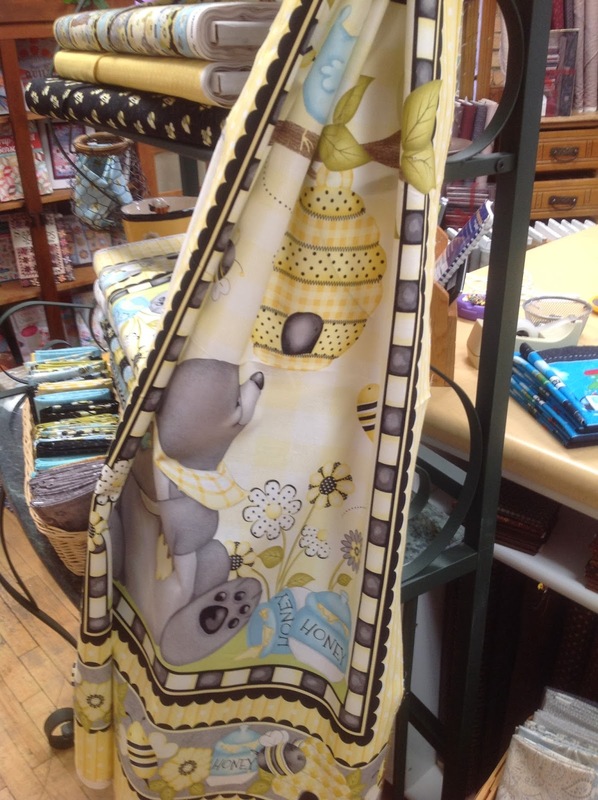 This very quilt was made for an adult.Really now, how darn cute is it? This is Ladies Album by Moda. I just love it! 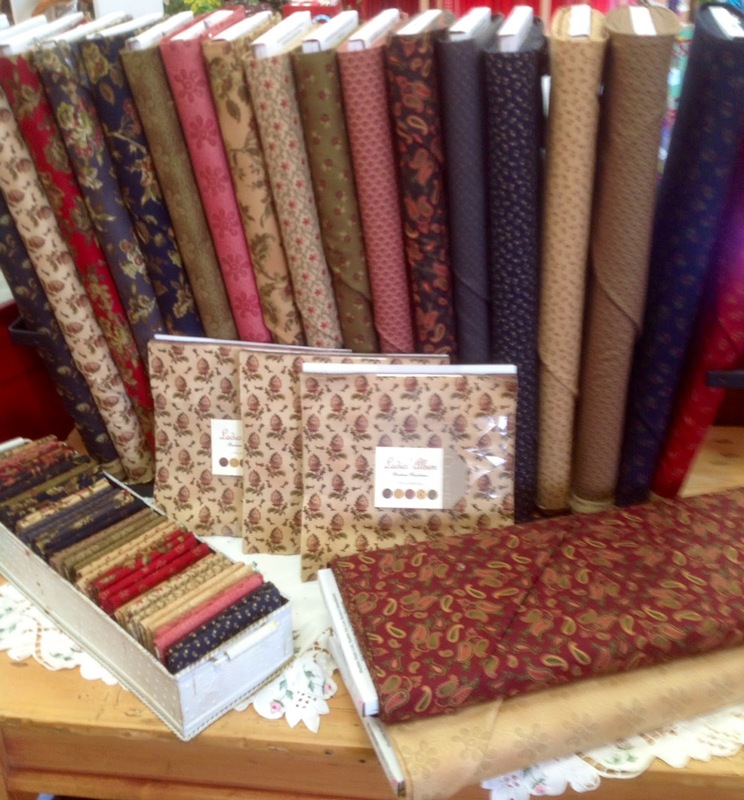 I looked up the history behind Ladies Album Quilting and it was fascinating. 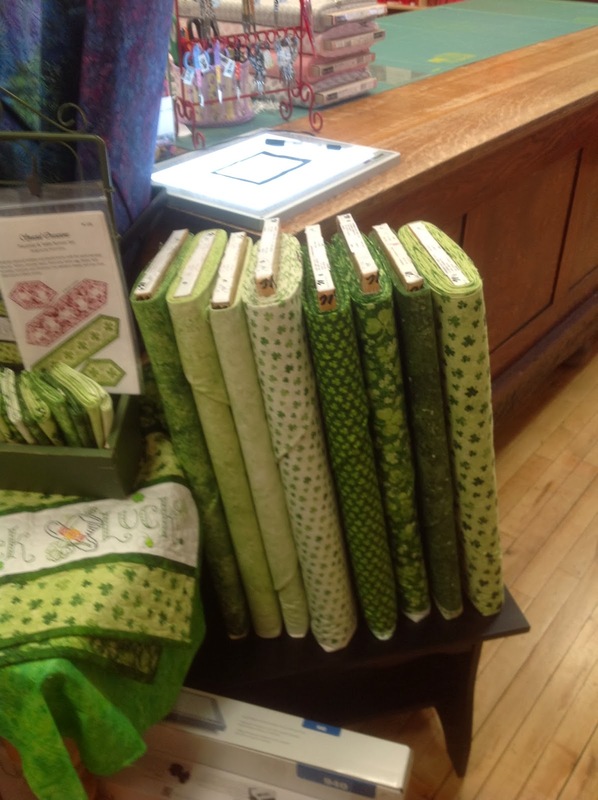 I want to make quilts with my friends and sign them and write messages too! This is the NEW Red Rooster line that depicts all the seasons. Here is a panel with tons of coordinates that you will be able to have the best time with. The coloration is amazing. What can I say.......? This entire line is so currant and fun. 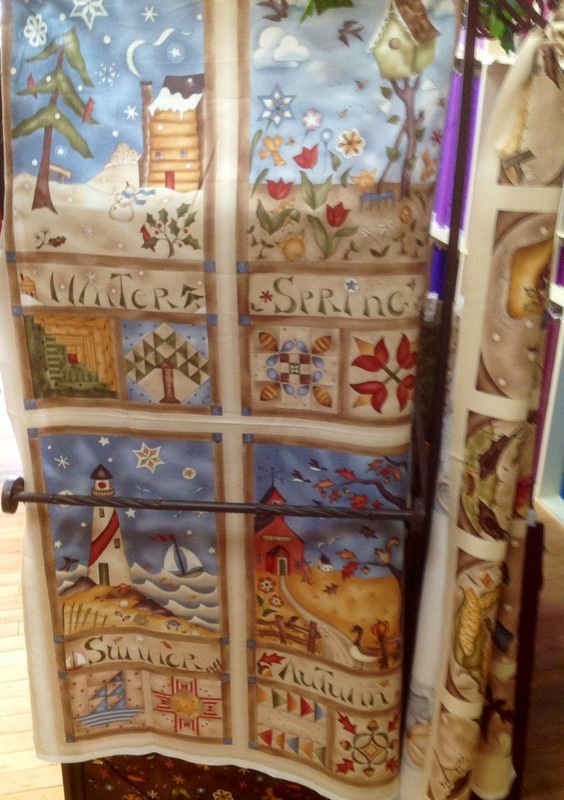 From quilts to bags to skirts to room decorating. With so many different bolts/designs to choose from, it just Screams Happy! I sure hope all of you had a great weekend and you celebrated National Quilting Day creating your most favoriteist quilt EVER! Coupled with St. Patrick's Day........Oh my gosh, you even had the luck of the Irish on your side. AND Friday was pie day, Thus a perfect weekend. What's not to love Right? 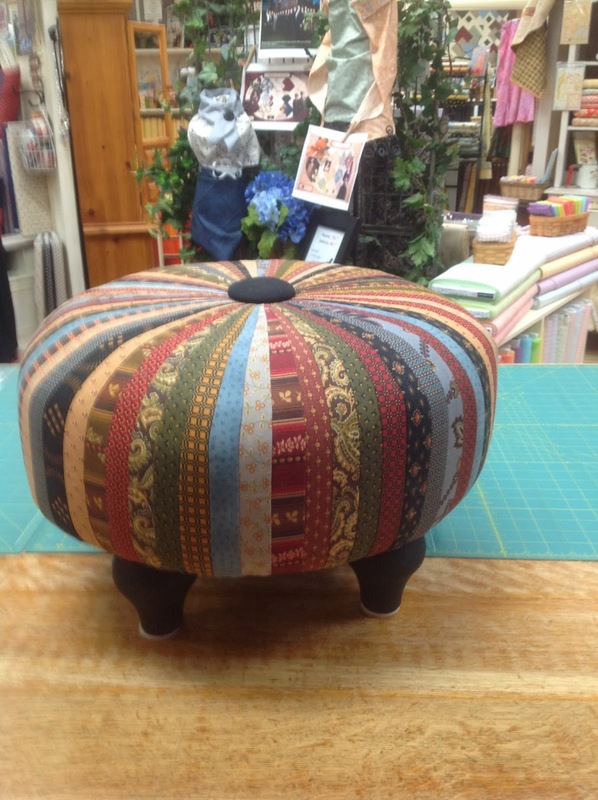 On Friday I sewed with friends after work, we had a yummy dinner and yes I brought PIE!!! We had the best time ever. Sewing and watching the movie Ever After. (Sew darn cute.) and visiting. Maybe I should mention "All at the same time!" I haven't laughed that hard in a long time. I don't know if any of us have laughed that hard in a long time. I nearly finished my quilt top, had great food, laughed my self silly and watched the girl get the Prince. Awesome huh? 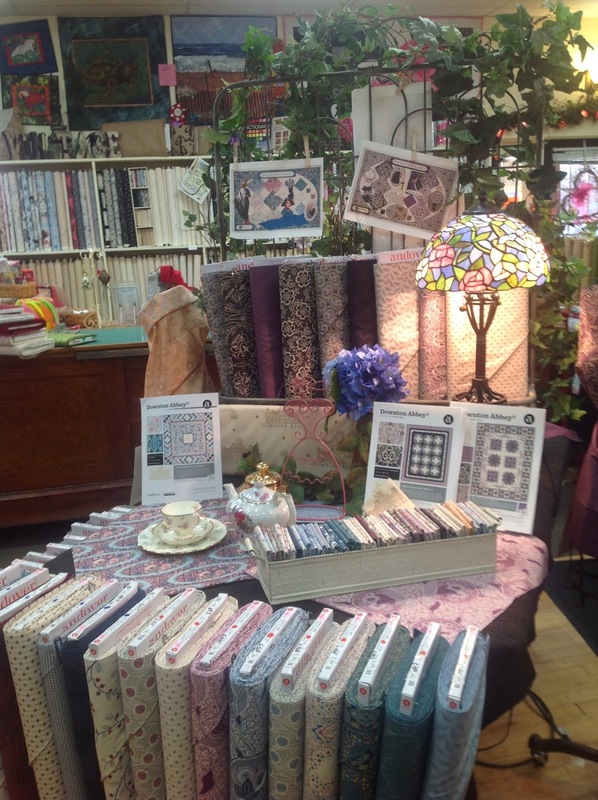 This Friday is Open Sew night. Sew come on over for a fun night of sewing, eating, sharing , laughing and might I mention it's a great stress reliever, "much cheaper than therapy!" AND we will provide a quick little Easter sewing project that we will make during Open Sew. 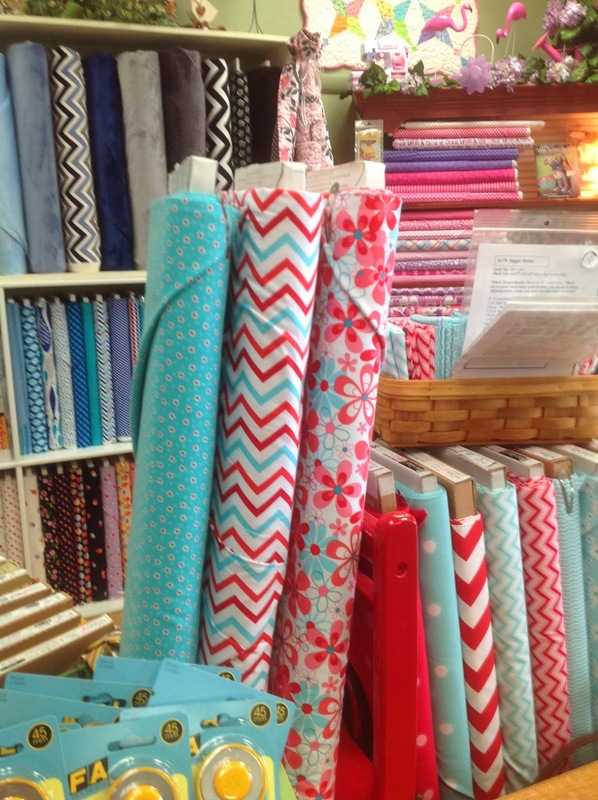 Speaking of Easter, it is just around the corner and we really have some cute Easter fabric in stock. 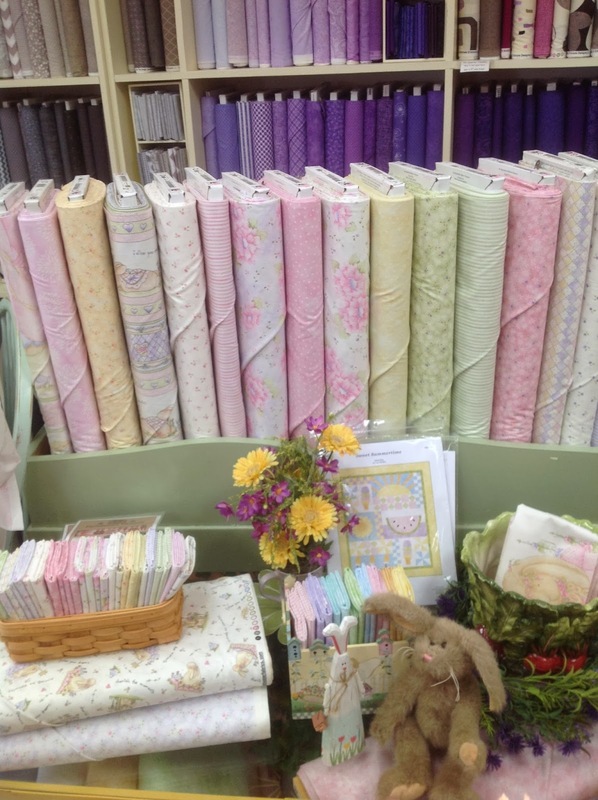 The Bunny panel in the picture has some squares in it that are perfect for making an Easter Basket. 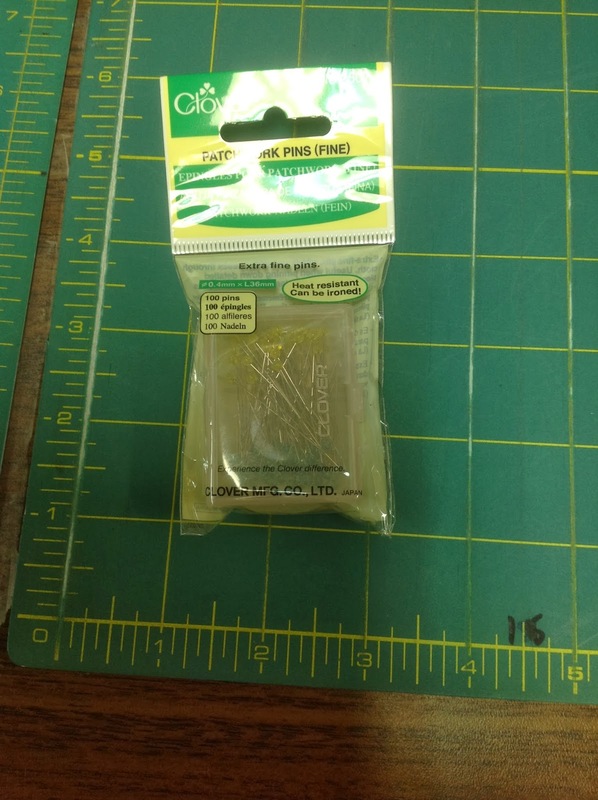 We have one made in the store for you to see. You see the squares along the bottom? Perfect for the basket and the Bunny at the top. Wouldn't that make a great pillow? 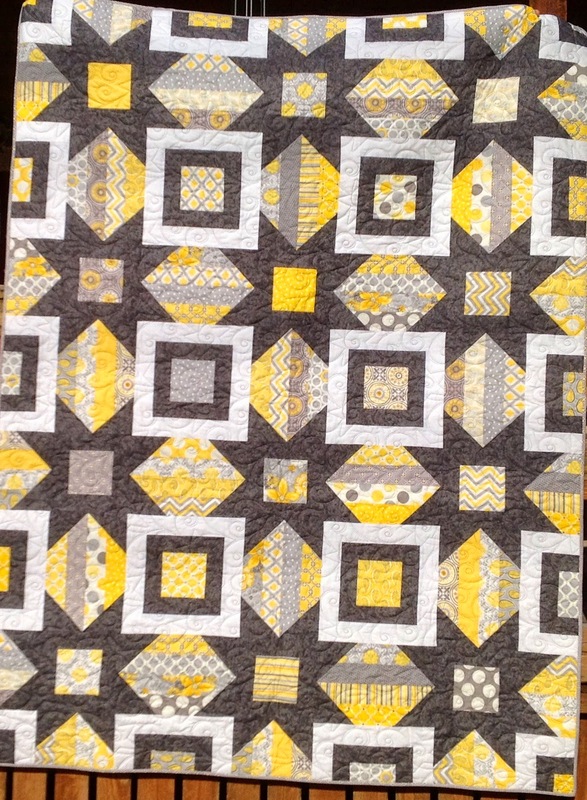 Then you could still use the center of the panel for a quilt or wall hanging. Super cute! Spring must be in the air! 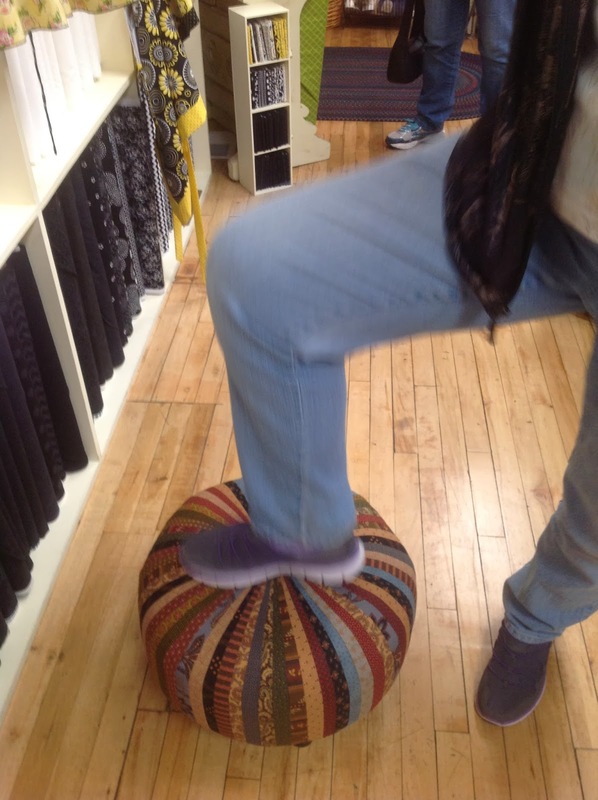 I want to sit on a Tuffit! Spring must be in the air because it's sunny one minute and snowing the next. Ya just gotta love our weather! While I'm at it, another notion that get sorta forgotten. Lets talk straight pins for a moment. 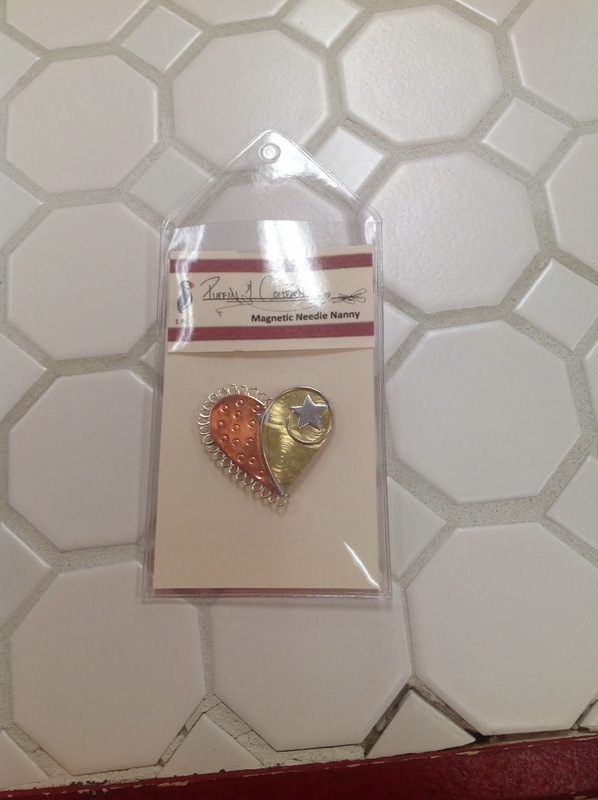 Some of us have our mothers and possibly our grandmothers old pins. (Worked for them ) Sorry to say....they get dull and really we need to replace them. I was sewing with a friend last week and she mentioned that every block she sewed she had to unpick and re do like three times to get her point right. She couldn't figure out what was up. She was pinning and matching her points everything she could think of.. I offered her to try a couple of my favorite pins. She did mention that she had lots of pins and that she had been pinning all along. But to be nice she tried my pins and WaLa spot on! These pins are very sharp and fine. Sometimes when we pin, we can't tell but we are actually shifting the fabric a bit therefore we don't line up where we want to. But these pins really do the job. Plus the ends are kinda clear and sparkly and yellow and blue! They scream CUTE! One of our awesome employees brought in a Tuffit for me to see. Can I just say... I need a Tuffit. I didn't even know that I needed a Tuffit, but after seeing one. I really do "NEED" one or maybe three. She is looking into the supply list and she said she would teach us (that's right, all of you as well.) how to make one....or in my case maybe three. SEW stinkin cute! This is all you get! Now you can figure out who the awesome employee is! This line is so precious and sweet and the pastel Stonehenge is perfect with it. St Patrick's Day is coming and this Stonehenge line is perfect. 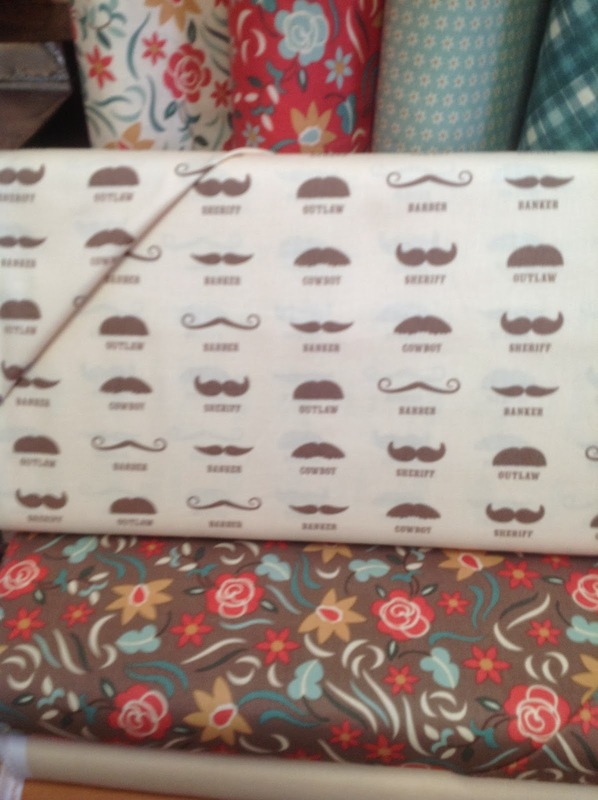 Mustache fabric is so hot right now. Don't you just love this color combination? 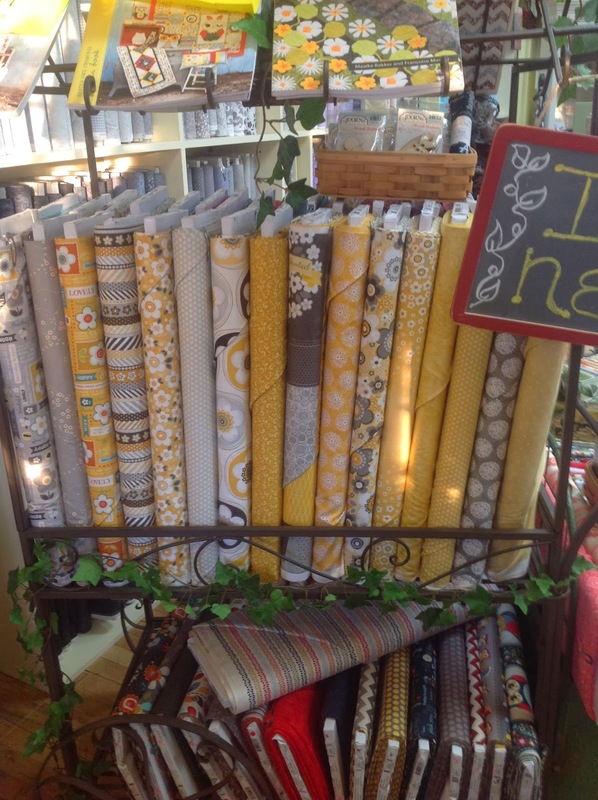 We have so many new fabric lines in the store and more coming all the time, I'll post a few, but come on in and see for your self's. Oh, we just got in the Zip Zoom line that is featured in the latest Fon's and Porter. One last thing, my daughter brought this over to share when her family came to dinner and all I can till you is that it was yummy....... 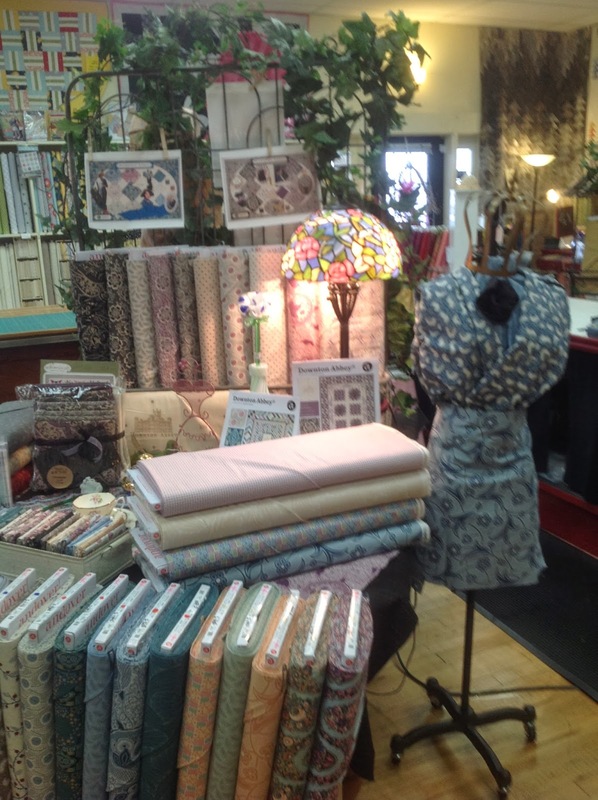 Thought I would share and remind you that Open Sew is this Friday February 21,2014. You can come any time, but those of us that work the store don't go down until after 6:00 pm. I will bring this salad to share and we will have chilli and cornbread as well as sewing and laughter and heaps and gobs of fun! I hope all of you had a great Christmas and I hope this New Year will prove to be the best ever for all of us! Life at my house was loud and crazy. Well at least during the times we were all together that is. I laughed when my grandson came in the kitchen to escape the mayhem of his mom and uncles. I reminded him when he and his sisters get older they will be the same way. He smiled and said "I know!" We both laughed. You know how it is when you get with friends and family and you all start reminiscing. Oh my gosh , now that is when the fun begins! You know what? This is also the time when the secrets come out. All the details that were supposed to be kept from mom........yep, I learn all kinds of stuff at these little get togethers! 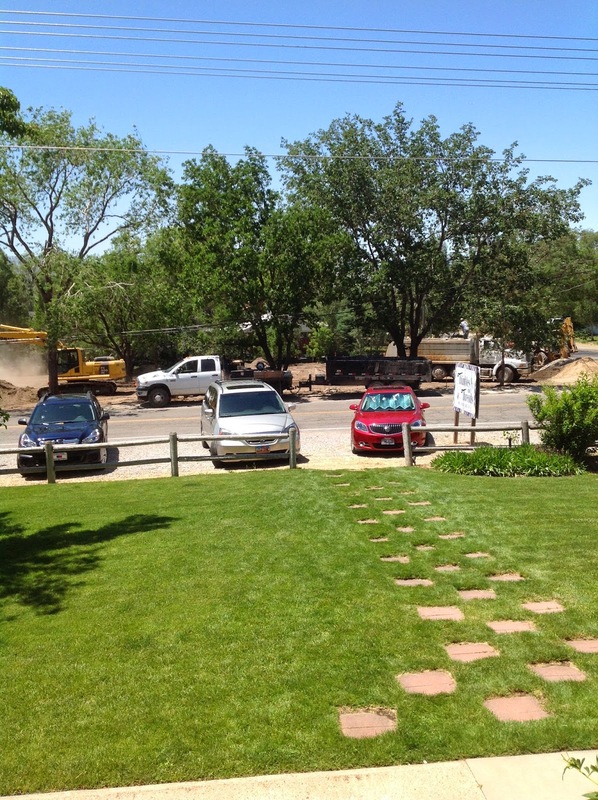 Things are happening across the street with the new building. Only it's not the things you can see. Still mucking through the red tape. We really hope and plan to start digging next month. When it happens I will post pictures for sure! 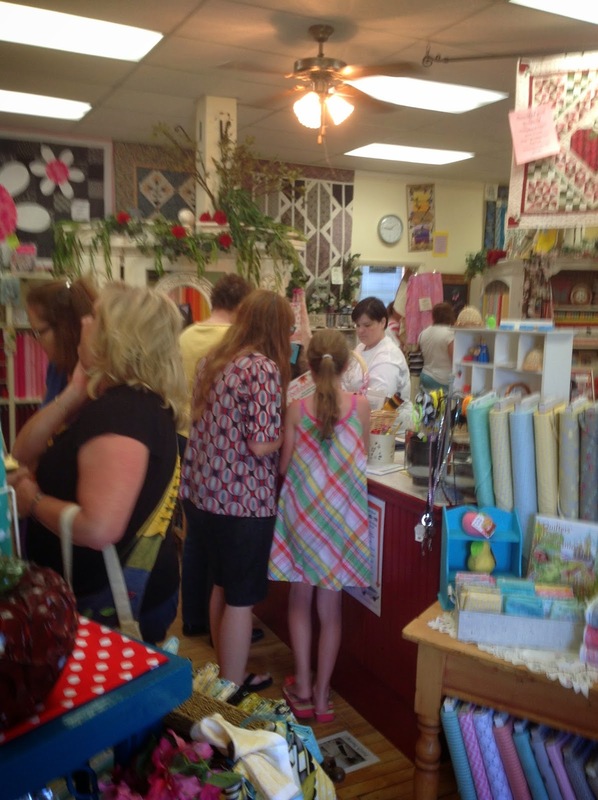 Last night was open sew and we had the best time! Yep, we were here super late but who cares? Good food, great company and lots of laughing, story telling, sewing and sharing. Doesn't get any better than that!!!!! 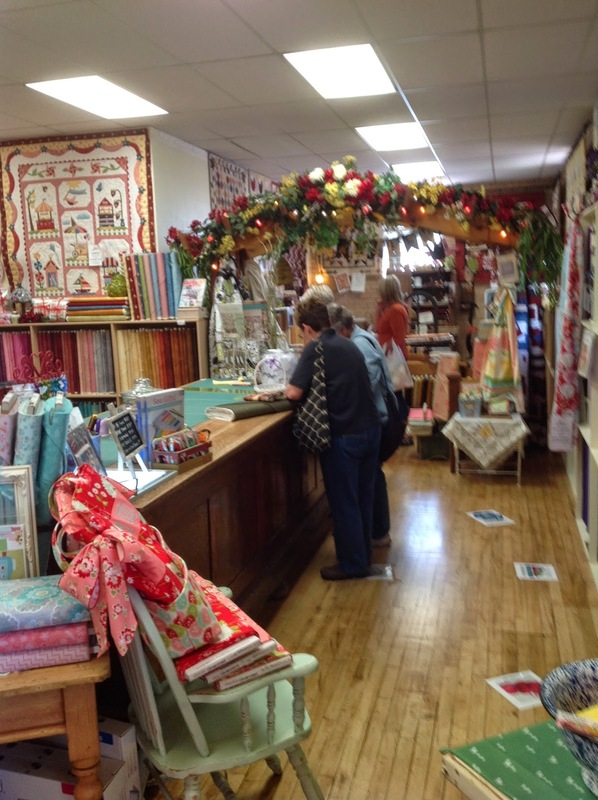 Classes here at Thimbles and Threads have started with more to follow. If you haven't signed up, now's the time. Check out the website, the list is there including pictures. 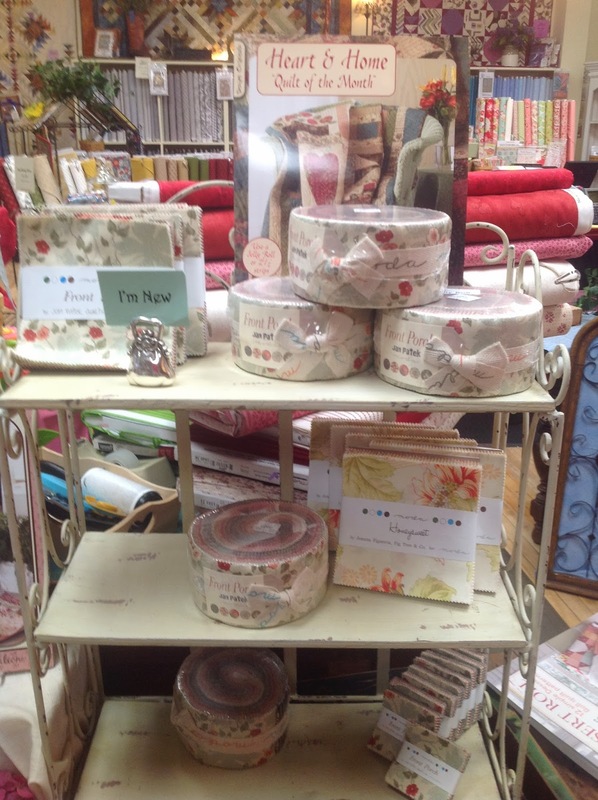 We have several new lines in including some great jelly rolls. Moda Front Porch . I totally love this line. I can hardly wait for it to come in. The Heart and Home book shown in the picture is perfect for this group. 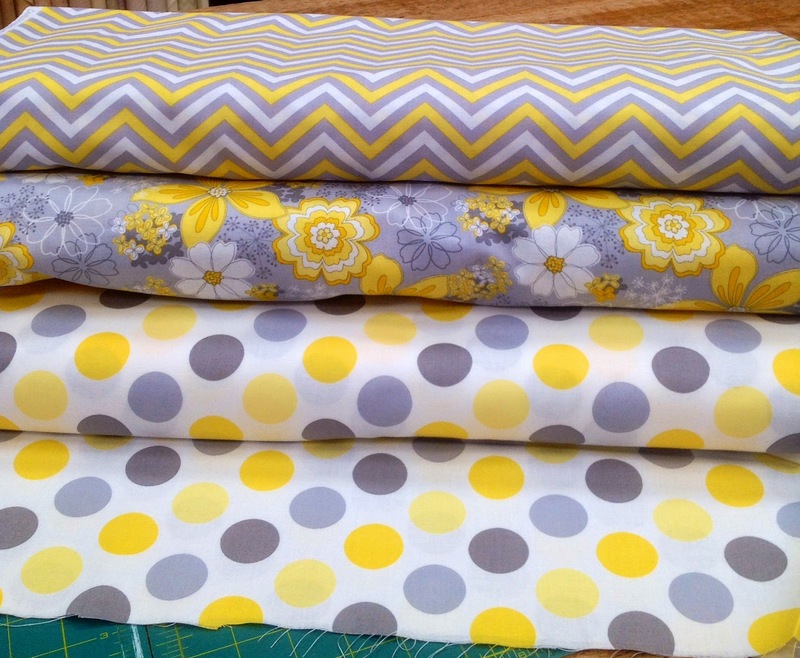 How cute is the Downton Abby fabric? This group is such a keeper! I don't even watch the show, but now I will! 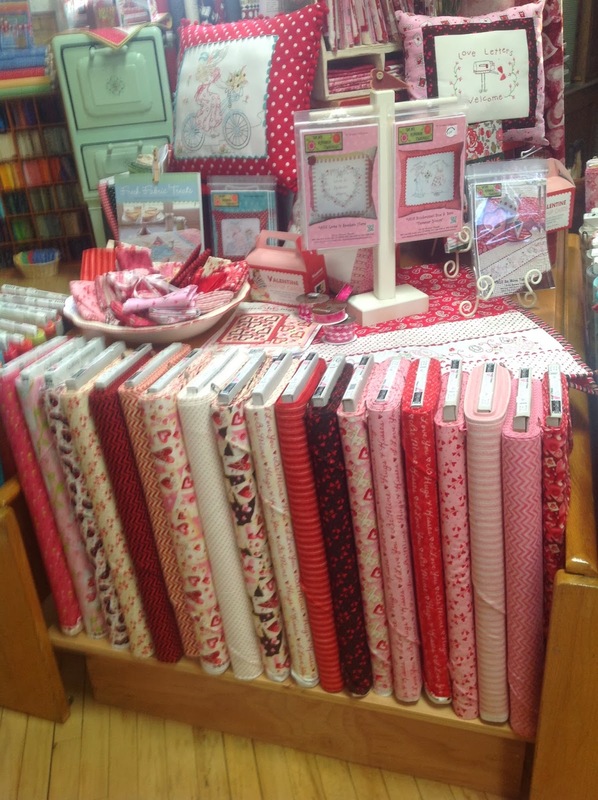 Valentine's Day is just around the corner and you can't help but love this fabric! Look how cute this banner is. We even have a class available. Here is the new Adorn it line in both color ways. I sure hope all of you have a great weekend and find some time to SEW!